Sporting Al Riyadi Beirut (LBL) inked 31-year old American shooting guard Dominique Johnson (192-88kg-87, college: Azusa Pacific, agency: Higher Vision Sports). He started the season at Pistoia Basket in Italian Serie A. In 15 games he averaged 14.1ppg, 2.9rpg and 2.7apg this season. 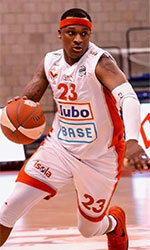 The last season Johnson played at Umana Venezia (also in Serie A). The team played in three different competitions (!!!) that year, and he had a chance to explore basketball on different levels. In 23 Serie A games he recorded 11.6ppg, 2.8rpg and 2.7apg. Johnson helped them to win the regular season and make it to the final. They also played in the Supercup final. A very good season in his career as he was selected to Eurobasket.com All-Italian SerieA Honorable Mention. Johnson also played 8 games in FIBA Europe Cup where he got 6.6ppg, 1.6rpg and 1.4apg. He contributed to his team winning the Cup. Johnson also played 14 games in Basketball Champions League where he got 10.4ppg, 2.1rpg and 1.9apg. In 2010 Johnson was drafted by Idaho Stampede (D-League) in third round (16th overall). The former Azusa Pacific University (NCAA Div.II) staris in his ninth season in pro basketball. Johnson has tried to make it to the NBA and played in the NBA Pro Summer League in 2012. He received All-NAIA D1 1st Team award back in 2010 at his college time. Johnson is a very experienced player. He has quite traveled the world as his pro career brought him to seven different countries on three different continents (Europe, Asia and of course North America). 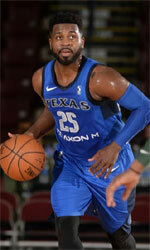 Johnson has played previously professionally also in China (Lhasa), Germany (ALBA Berlin), Israel (Rishon), Poland (Slask and Siarka), Turkey (Banvit) and NBA G League (Sioux Falls Skyforce, Texas Legends and Canton Charge). His game is described as: Dominique is an athletic 6'5" combo guard with a strong body and great ability to score and defend. He is an outstanding teammate and personality, a smart player who is better suited in Europe as a scorer and a top defender. Dominique is shockingly successful having come from a NAIA school. Even so, Dominique could easily become one of the top players in Europe even at the Euroleague level. Riyadi upset Champville to take the lead in the series. Al Riyadi dominated down low during the game scoring 52 of its points in the paint compared to Champville's 30. Strangely Champville outrebounded Al Riyadi 42-30 including a 16-4 advantage in offensive rebounds. Worth to mention a great performance of the former international point guard Wael Arakji (194-94) who helped to win the game recording 19 points and 5 assists. The former international swingman Jean Abdel-Nour (198-83) contributed with 15 points and 8 rebounds for the winners. Four Al Riyadi players scored in double figures. Iranian center Hamed Haddadi (218-85) answered with a double-double by scoring 15 points and 14 rebounds and the former international swingman Ahmad Ibrahim (198-92, college: Rice) added 21 points and 6 rebounds in the effort for Champville. Homentmen rallied past Beirut Club in the opener. Homentmen dominated down low during the game scoring 58 of its points in the paint compared to Beirut Club's 36 and made 16-of-17 charity shots (94.1 percent) during the game. Nigerian-American guard Michael Efevberha (193-84, college: CS Northridge, agency: Octagon Europe) stepped up and scored 30 points and 8 rebounds for the winners and U.S. Virgin Islands-Puerto Rican point guard Walter Hodge (183-86, college: Florida) chipped in 19 points and 5 assists. Five Homentmen players scored in double figures. Homentmen's coach Joe Nebhan allowed to play the deep bench players saving starting five for next games. At the losing side the former international forward Ali Haidar (201-90, college: Michigan Tech) responded with 18 points and 9 rebounds and American guard Chris Crawford (193-92, college: Memphis) scored 20 points and 4 assists.